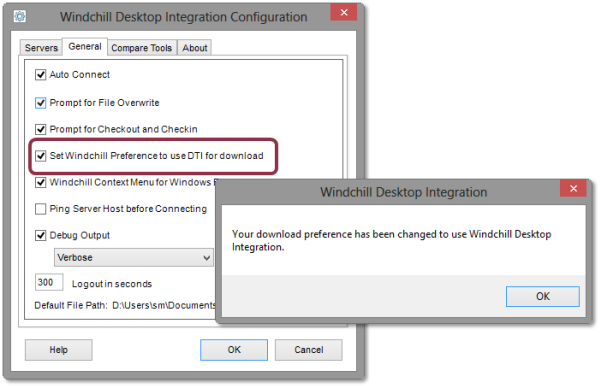 In PTC Windchill 10.2, users have greater control over Desktop Integration Client (DTI) prompts, download behavior, and preferences. Active management of the File Download Mechanism preference: A new configuration option checks the File Download Mechanism preference when a user connects to a Windchill server. If the preference is not set to use Desktop Integration, then Desktop Integration sets the preference accordingly. Enhanced ability to control file download behavior: Desktop Integration users no longer see a Save As prompt if their File Download Behavior preference is set to Always open file in application. Prompt to open local files: If a user opens a document from Windchill and has a modified version of that document locally saved, they receive a prompt asking if they would like to open the local version instead. With this option enabled, Desktop Integration ensures the correct Windchill preference is being used for DTI.